A student at a Texas college filed a lawsuit Wednesday claiming administrators shut down her free speech event that included a gun rights sign, telling her she needed "special permission" and that it was unclear if she could advocate for gun rights on campus. Nicole Sanders filed the federal lawsuit against Blinn College in Brenham, Texas, after her event was shut down earlier this year. The lawsuit challenges the school’s restrictions on free expression, including the policy that requires college officials approve all material distributed on campus. Sanders and another student were trying to get students to sign up for the group Young Americans for Liberty, and they held two signs outside the Student Center. The first sign read, "Defend Gun Rights on Campus." 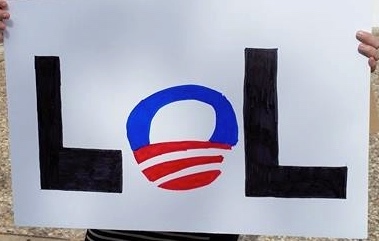 The other sign read, "LOL" with the Obama presidential logo replacing the "O." Campus police officers and the coordinator of the Student Center and Campus Events approached the students when they entered the Student Center. The administrator told them they needed special permission to collect sign-ups for their YAL club and to display their signs. According to Sanders, the official added, "I don’t know that you can get special permission" to advocate for gun rights, and said she was not against guns, but "on campus, I’m not so sure." A video of the exchange was obtained at the time by Campus Reform. "I felt that the officers were there to intimidate us and it worked. It was an easy way for the school to shut us down," Sanders told the Washington Free Beacon in an email. "I was very surprised that we were even approached and even more surprised that we needed permission to talk to students about a club on campus. " When asked if she believed she was shut down due to the gun rights sign, she said, "Yes, I believe it was specific to gun rights because the lady, Sherri Rich, said so. She said she received an email stating somebody was offended." Rich is an assistant of student leadership and activities. The lawsuit also accuses Blinn College of taking a month to approve palm-sized cards YAL had prepared to hand out to students explaining their Fourth and Fifth Amendment rights. "The delay for the palm cards stopped us from handing them out to students," Sanders said. "By the time they were approved, the semester was just about over." "I'm trying to teach students about the Constitution but also how it relates to everyday life, and how they can use it when dealing with the police, and that's what I believe Blinn has a problem with," Sanders said. The lawsuit also challenges the college for restricting speech to a small "free speech area" where students must go to hand out literature. It also alleges Sanders’ ceramics professor threatened her with retaliation if she sought to take action against the school. The Foundation for Individual Rights in Education assisted Sanders in filing the federal lawsuit. "Blinn College administrators sacrificed the First Amendment in order to stop Nicole from talking about the Second, Fourth, and Fifth Amendments," said FIRE associate director of litigation Catherine Sevcenko, in a prepared statement. "But public colleges like Blinn are bound by the First Amendment, which gives all citizens—including college students—the right to speak out on the issues they are passionate about, whether gun rights or gay rights." The college’s policies require student groups to get approval from four administrators a month in advance for any expressive activity on or off campus. Students are also required to fill out an "Activity Report Form" describing what happened at the activity and include details about the content and student discussions. Students who do not get prior approval must go to the college’s "free speech area," which is a small area on the 62-acre campus. "Blinn College thinks it’s acceptable to have a free speech zone that is the size of a parking spot. But the Constitution’s free speech zone is the size of the United States," Sevcenko said. "This case is yet another example of college administrators trying to quarantine the First Amendment." FIRE continues to file lawsuits on behalf of students and eight lawsuits have been filed since July 2014. "Nicole’s suit is the tenth that FIRE has managed under its Stand Up For Speech Litigation Project and the eighth since July 2014. Although we are very proud of our success–five settlements that have restored First Amendment rights to 150,000 students–the fact that we’ve needed to support these lawsuits is disturbing," Sevcenko said in an email. "No student should have to go to court to stop college administrators from trying to quarantine the First Amendment," Sevecenko said. "I am very surprised by the restrictions at Blinn. It feels like I'm back in high school asking my mom to sign a permission slip for a field trip," Sanders said. "I want to get students interested in politics, to know what's going on at a national and state level. That's what I believe is important and makes me wonder why a school would want to stop that because it's not very common to find a young adult interested about politics." This entry was posted in Issues and tagged 2nd Amendment, First Amendment, Guns, Texas. Bookmark the permalink.